Product prices and availability are accurate as of 2019-04-03 17:48:59 EDT and are subject to change. Any price and availability information displayed on http://www.amazon.com/ at the time of purchase will apply to the purchase of this product. Leaftrend 6 inch Square Leaf Shaped palm leaf plates are made of unique, renewable and biodegradable raw material. Leaftrend palm leaf plates are made in love with nature. During the manufacturing of palm plates and bowls, no trees are being cut. Palm leaf plates and bowls are made from handpicked fallen leaves from palm trees. Without exposing any chemicals or glues, palm leaf plates and bowls are made from our facility in India. Each of our plates and bowls is carefully selected and are very clean and sturdy. These 6 inch Square Leaf Shaped palm tree plates are ideal for Ice cream logs or terrines, scallop crudo and other dishes. Being an alternative to plastics and paper; these plates can be used every day or can be reserved for special occasions. Microwave and oven safe, you can serve hot and cold foods with our light and durable plates. Other names: Areca leaf plates, organic plates, green leaf plates, green plates, palm tree plates. Category: Disposable plates, use and throw plates, dinnerware sets, restaurant plates. Occasions: Wedding, party, birthday celebration, Halloween, environmentally friendly events and other functions. Uses: Great to use for picnics, buffets, receptions, retirement parties, holiday meals, business events and at organic restaurants. 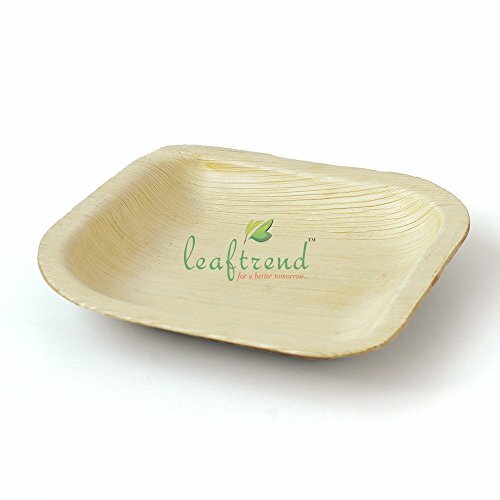 Leaftrend's Ecofriendly 6 inch Square Leaf Shaped Palm Leaf disposable and biodegardable Dinnere plates. 6 inch Square Leaf Shaped palm tree plates are ideal for Ice cream logs or terrines, scallop crudo and other dishes. 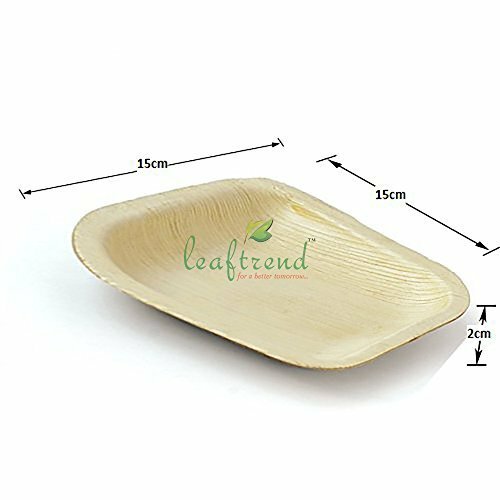 Dimension of the plates are as follows: Length-15cm Width-15cm Depth-2cm ECO-PALM PLATES: Leaftrend palm leaf plates are made in love with nature. During the manufacturing of palm plates and bowls, no trees are being cut. Palm leaf plates are made from handpicked fallen leaves from palm trees. 100% NATURAL, BIODEGRABLE AND COMPOSTABLE: Without exposing to any chemicals or glues, palm leaf plates and bowls are made from our own facility in India. Even used palm plates can be broken into small pieces and used as organic composites in the kitchen garden. ELEGANT PARTY & RESTUARANT TABLEWARES: These disposable palm plates are "Nature's Gift" and better replacement of Anti-Environment plastics or polymers. 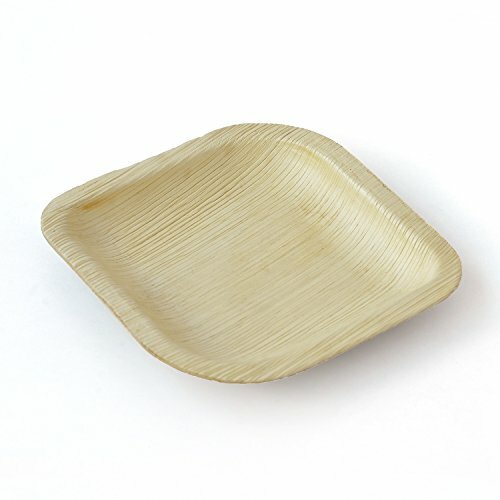 Elegant and disposable palm leaf plates are perfect for restuarants, weddings, parties and other events. Palm plates can be used as party plates, wedding plates, tablewares and dinner sets. Contemporary style, ideal for many different restaurants. PARTY USES: Dispoable party palm leaf plates and bowls can hold liquid and are heat safe. Palm leaf plates can be kept in MICROWAVE for 2 minutes in high temperature. Palm leaf plates are best suited for weddings, cocktail parties, appetizers, BBQs, picnics, indoor, outdoor and home caterings.